Daniel Callahan is Senior Research Scholar and President Emeritus of the Center. He was its cofounder in 1969 and served as its president between 1969 and 1996. He is also co-director of the Yale-Hastings Program in Ethics and Health Policy. 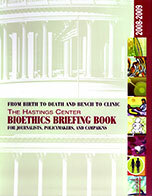 Over the years his research and writing have covered a wide range of issues, from the beginning until the end of life. In recent years, he has focused his attention on ethics and health policy. Trained as a philosopher, he has served as a Senior Lecturer at the Harvard Medical School and is now a Senior Scholar at Yale. Thomas H. Murray is President and CEO of The Hastings Center. He was formerly the Director of the Center for Biomedical Ethics in the School of Medicine at Case Western Reserve University, where he was also the Susan E. Watson Professor of Bioethics. He serves on many editorial boards and has testified before many Congressional committees. Among other current posts, he serves as Chair of the Ethical Issues Review Panel for the World Anti-Doping Agency, International Expert Advisor to Singapore’s Bioethics Advisory Committee, and Vice Chair of Charity Navigator. He has been president of the Society for Health and Human Values and of the American Society for Bioethics and Humanities. He is currently PI of The Hastings Center’s project, funded by the Alfred P. Sloan Foundation, on ethics and synthetic biology. He is writing a book on values, drugs, and sport with the working title Why We Play. Dr. Mildred Z. Solomon is Senior Director for Implementation Science at the Association of American Medical Colleges and Associate Clinical Professor of Medical Ethics in the Department of Global Health and Social Medicine at Harvard Medical School and the Department of Anesthesia at Children’s Hospital Boston. She is a social science researcher who studies normative and empirical ethical issues in medicine, health care, and the life sciences. She has contributed to education, policy, and practice on a national and international scale in both adult and pediatric end-of-life care, organ donation, pain management, sexually transmitted disease prevention, and the protection of human research participants. She will join the Hastings Center as its new president in July.